These past couple of weeks haven’t been the easiest patch for me. But, I do realize that I am blessed and that there is joy all around me…I just need to refocus and reframe things a bit. So, I give you this lovely bowl of tomatoes that we bought at the farmers’ market on Sunday. I truly appreciate each and every click! Buying a Delivery Gown: Smart or Silly? Beautiful bowl of tomatoes!! If you lived closer I could give you those exact goodies from my garden!! Hint, hint! I hope I haven't written anything in the past that has hurt you more on this journey, but I probably have, because I try to be funny to cheer people up…and we all know how annoying THAT is. Tomatoes are better, much much better. xoxox. You know what else is perfection right now (in addition to tomatoes) are yummy peppers (the actual breed name). They're small & orange, should be available at most any farmer's market . . . they look like they should be really, unbelievably hot – but they're not. They're sweet. And addictive. I clicked on every one. Because I love you, not because I've developed a sudden interest in delivery gowns. I know you realize you are blessed. It shows in your words. We all go through slumps. I hope the joy around you helps life you up. Those tomatoes look amazing. Yummy. Maybe a little salt or balsamic vinegar, and I could eat them all day long. I'm clicking away at them all and even pinned on on pinterest, hoping it brings you lots of traffic ;). Thinking of you as always. Those are all tomatoes? Really? How pretty! 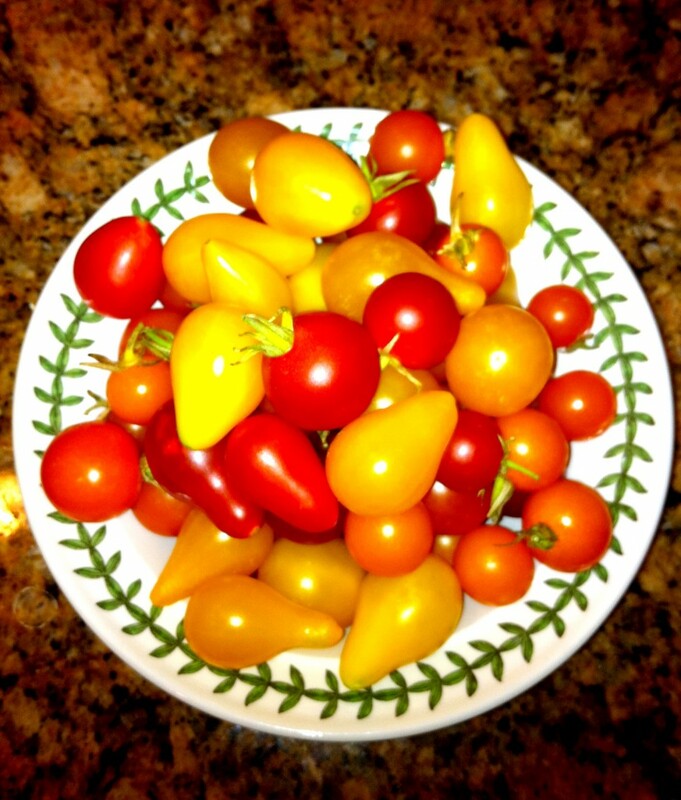 Beautiful tomatoes! And hugs to you, my friend.